All of the books available for beta testing have been sent out and we’re starting to get some great constructive feedback for them. Even if some of the suggestions do not make it into this first edition, they’re all being recorded and stored to influence later editions and Furrow Books products – so keep those responses rolling in, testers! Here’s an image of roughly what the first Furrow Books editions will look like, once completed. 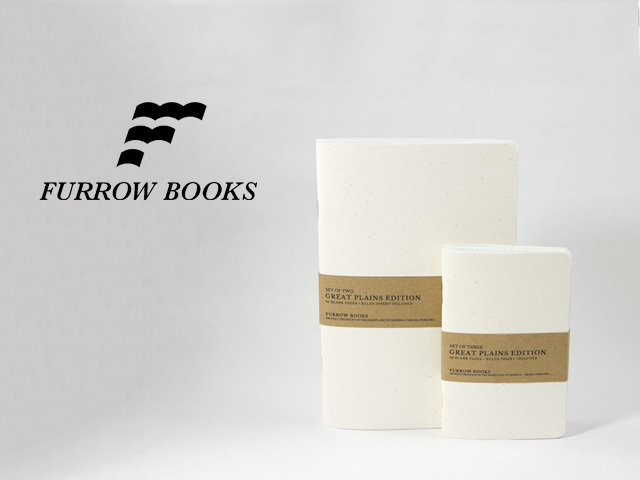 You’ll probably notice two things in the image above: 1) completed packs of the pocket and large size editions of Furrow Notes; and 2) the new official logo for Furrow Notes! The editions above are rough mockups of how the final completed packs will appear (without the heat sealing.) The band will be different in the final product (and will be released for viewing early to campaign backers!) We printed these bands out here, in shop, and when you look close, they’re pretty rough (they’re printed on the packing paper we use to package orders over at ZWC, and the one on the large doesn’t even connect all the way in the back.) We just wanted to get some basic images up for those interested in seeing our vision of the final product. The logo was created by the talented Scott Fuller of The Studio Temporary. He’s a fantastic graphic designer based out of Newnan, GA and was awesome to work with. We feel that the final logo design fits very well with our brand, and you’ll be able to read about his take on it in a later interview, right here on the blog. He’s also the one designing the Furrow Books belly bands, and we can’t wait to show you all what he’s come up with! That’s all for now – we’ll post more information as soon as its available.